The Ridge™ folio case by Devicewear for the New iPad is the whole package: It provides excellent protection for your iPad with classic styling and features that are unparalleled. Designed to both look good and feel good, The Ridge's textured vegan leather exterior shields the iPad from bumps and bruises while its soft microsuede interior cushions the screen from scratches. This slim case (adds only 7 mm of total thickness) provides excellent protection all around. The unique design allows for six varied viewing angles for optimum ease of use, and whereas other cases use the iPad itself to sit in the grooves to allow for multiple viewing angles, The Ridge™ has a small plastic lip or "ridge" that sits at the bottom of the iPad and slips firmly into the grooves to hold the iPad in place more securely. It is smart-enabled, utilizing the "on/off" function of the iPad, and the camera and ports are all easily accessible. 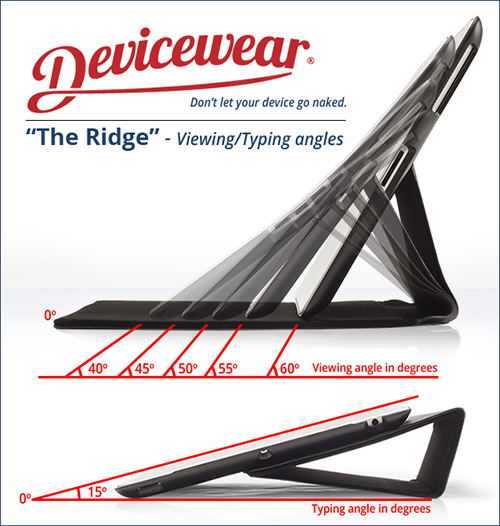 With its sturdy construction and classic styling, The Ridge™ is the perfect fit for the iPad. Very Slim Vegan leather case for the iPad. Protective outer casing in sturdy exterior with soft, black microsuede interior. Smart enabled so that iPad is put to sleep or awakened when case is opened or closed. Keeps your case closed with simple magnetic lid no other straps or clips. The iPad snaps in easily and can be viewed in 5 landscape modes and also flips around for convenient typing feature.